DUG Insight User ManualFrequently Asked QuestionsFrequently Asked Questions PetrelHow do I transfer an on-the-fly horizon to Petrel? To transfer an on-the-fly horizon (e.g. TWT in depth, extracted amplitudes) to Petrel, first output the values to a new horizon. This example shows how to transfer TVD values from on-the-fly depth-conversion to Petrel. Note: Ensure a velocity model is configured for depth conversion (see How it Works: Time-Depth Conversion). The Petrel link must be connected to transfer horizons and/or faults (see Insight and Petrel Overview). 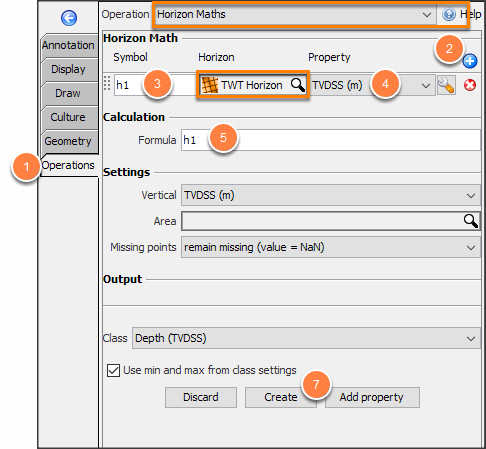 Use horizon maths to output the depth values to a new horizon. In the Map View > Operations tab, choose Horizon Maths. Use the default symbol: 'h1'. Push the new horizon to Petrel using the link. In the Horizon tab, right-click the horizon: “TVD Result”. Next: How do I transfer depth-converted faults to Petrel?